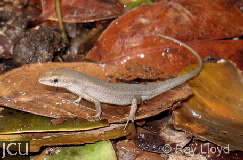 This skink is found in a variety of habitats particularly where it is shaded and humid and grass is present. The body is brown to pale olive-brown and there is a narrow paler vertebral stripe present in both sexes but in the female there may be additional stripes. The breeding males flush orange. Four fingers per forelimb, 5 toes per hindlimb.